I finally got some call numbers. Not for everything, but for a better portion than I thought I would: about 7,600 records, or c. 30% of my books. The HathiTrust Bibliographic API is great. What a resource. There are a few odd tricks I had to put in to account for their integrating various catalogs together (Michigan call numbers are filed under MARC 050 (Library of Congress catalog), while California ones are filed under MARC 090 (local catalog), for instance, although they both seem to be basically an LCC scheme). But the openness is fantastic--you just plug in OCLC or LCCN identifiers into a url string to get an xml record. It's possible to get a lot of OCLCs, in particular, by scraping Internet Archive pages. I haven't yet found a good way to go the opposite direction, though: from a large number of specially chosen Hathi catalogue items to IA books. P is literature and criticism, which there's a lot of. C, D, E and F are history, the latter two American; B is philosophy and religion, H is social sciences, Q is physical sciences, L is education, and nothing else (medicine, technology, etc—even "O," which I don't think exists) is over 200 books. So what do we do with them? First, let's make sure they look like they make sense on some old problems. 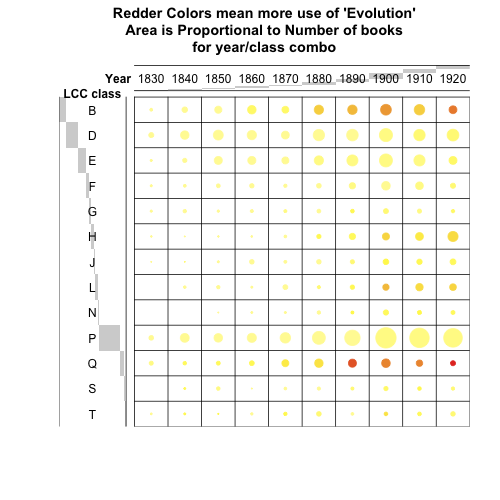 How much do these classes use the word "evolution"? Some of these classes are quite small, but the general numbers look about right. Sociology uses the word "evolution" almost a hundred times more frequently than American history. That's a nice illustration of, though not a revelation about, the importance of evolutionary thought for some of the social sciences even compared to biology. Ethics is higher than I would have thought—I'll have to correct my sampling functions so I can get text examples of just what that is. How about more common words? Like the one I'm writing about? I'm pleased about this, since I'm arguing a lot for the importance of existing educational discourses of attention shaping popular psychology in the 1920s and 30s. BF (Psychology) clocks in at .610. I need to look at the usage, but the prominence of music is good for that half-chapter I've been pitching on listening manuals. Mention doesn't imply contestation, of course—I think the medical category is high because of diagnosis, and military may be just because of the drill word—but it's not a bad proxy, as they go. So the Michigan and the Cal books are the best, and they're some of the biggest partners in Hathi; and Harvard, only just recently a member of Hathi, is the worst. But it's pretty even across the libraries--using internet archive data, library data alone can't explain whether there's call number data. Internet archive is partly to blame--they only have OCLC ids for about two thirds of the books I downloaded, and they don't nicely integrate them into their downloadable catalogs. But the rest of the variation is odd--there are some gaps between IA's holdings of books and what I can get. Next up is way of integrating dimensional analysis with catalog data. Probably a little commentary before that, though. What does agriculture have to do with attention?! I think it's a use-mention thing—agriculture books are probably more instructive than other genres, so they do things like tell farmers to pay careful attention to signs of boll weevil infestation. That's why, I suspect, medicine is so high as well. They're not describing attentional disorders in the 19th century, they're telling doctors to pay attention to symptoms in diagnosing other diseases. Or at least that's what I'd guess, I still have to make my sentence sampler work on particular genre subsets. I think it's slightly more interesting than that, after looking at the texts: "Agriculture" also includes a _lot_ of books about hunting and fishing, and animals and fish are frequently described as having attention gained or diverted. Not all of it is like that, but maybe enough to explain the excess over normal. I like that a lot: I'm mostly interested in folk child psychology, but animal psychology adds an interesting dimension I've only thought about a little.